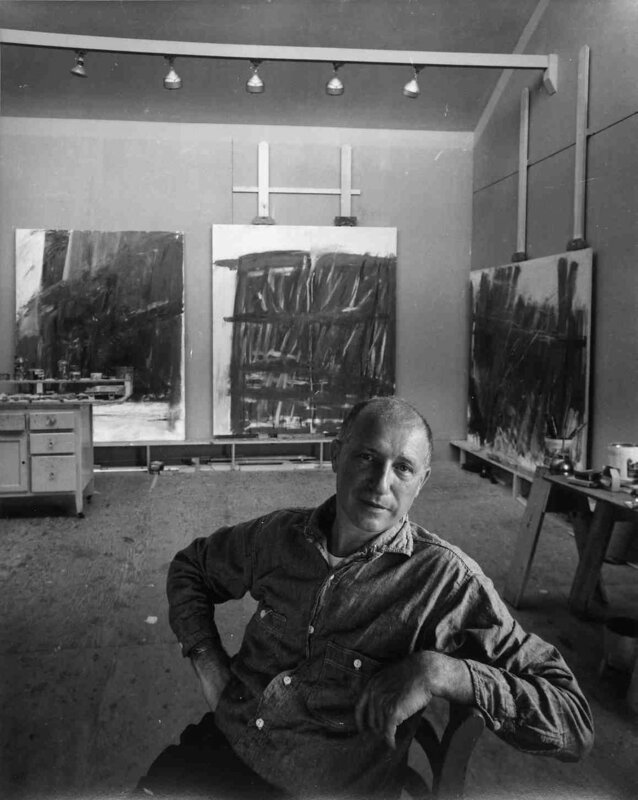 Jack Tworkov in his Provincetown studio, 1960. Photo: Arnold Newman, © Arnold Newman / Getty Images. Courtesy Tworkov Family Archives, New York. How has the catalogue raisonné matured in the 6 years since the online launch of Jack Tworkov: A Catalogue Raisonné Project? What has matured most has been a major shift in scholarly acceptance of online platforms supporting catalogue raisonné research. My research is ongoing and this approach, with an aim to be definitive, makes for a living and breathing resource for the life and work of Jack Tworkov. It’s exciting that so many artists and estates are now pursuing online publishing to make available their catalogue raisonné research. How does the catalogue raisonné help us to understand Tworkov as an artist–perhaps both within and outside of the sphere of Abstract Expressionism? The purpose behind the launch of the online catalogue was to bring focused attention to the life and work of Jack Tworkov. Having the catalogue available online offered greater exposure, making information and imagery available to a world-wide audience. As a result, we have witnessed a greater understanding and appreciation of Tworkov and his work. As an artist most notably connected to history as a first generation Abstract Expressionist, this catalogue, with one click, expands the conversation beyond the significant ‘50s to include Tworkov’s groundbreaking conceptual paintings of the ‘70s and early ‘80s (which today are still relatively unknown). What are some of the ways in which archival resources have cast a light within the catalogue raisonné? The original launch of the online catalogue occurred simultaneously with the publication of the artist’s writings by Yale University in 2009. Letters to and from Jack Tworkov that spoke specifically about the loan and sale of the artist’s works were extremely helpful in charting provenance and exhibition histories. Moreover, Tworkov’s writings, as critical primary source material, offered a window through which we could understand the psychology of the artist. In recent years we have expanded our research to the archives of galleries, museums, and institutions that acquired work or where Tworkov taught or exhibited. We recently uncovered an interview the artist gave responding to a questionnaire regarding one of his epic paintings titled Thursday (1960), which at the time was in the Sarah Campbell Blaffer Foundation and now is in the collection of the Hirshhorn Museum and Sculpture Garden, Smithsonian Institution, Washington, DC. The transcript offers a first hand account that ranges from biographical information to the impetus and intention behind the making of this painting. It was the first time in the 16 years of working with this material that I learned that when making this painting Tworkov “had in mind thunder; not the image; but the sound.” He said, “Thursday was really Thor’s day.” Just when you think you have learned everything you thought possible, new research moves us closer to the facts. It was amazing for me to learn this. Tworkov is also among the rare number of artists who have had both their paintings and their writings (Extreme of the Middle: Writings of Jack Tworkov, Yale University Press) compiled. How are his ideas reflected in his works of art? Tworkov was one of the great intellects of his time. His daily journals and studio notes add to the psychology of the artist. In many instances the artist would record the start and finish of a painting in his journals, and this information is reflected in the catalogue of his works. And often times, dated paintings have helped us archive the letters in which he discusses the painting. The writings and the works of Jack Tworkov serve in tandem to animate and contextualize the catalogue. So much of his writings were unpublished, so we are tasked with the process of revisiting these unpublished writings to learn even more about the time and mind frame of the artist when he made these master works. What went into the decision to incorporate images of the artist’s own inventory cards into the catalogue raisonné? Authenticity is at the core of every catalogue raisonné project. We were lucky enough to have in our archive the original individual inventory cards maintained by the artist as well as those later maintained by his widow. These inventory cards are the backbone of our research. Each has been scanned and linked as supplementary images within each entry. They are our authenticity markers for all works viewable publicly online. How did the Tworkov catalogue raisonné come to be included in the New York Art Research Consortium’s web archive for born-digital catalogues raisonnés? What factors went into the decision to pursue this partnership? In 2014, I attended the CRSA-NYARC panel on the subject of archiving and research preservation at the Brooklyn Museum Library. There I met Sumitra Duncan, the NYARC Web Archiving Program Coordinator at the Frick Reference Library. She explained that the Frick was beginning an ambitious process of digitally archiving important databases. And of course, I wanted in. Sumitra was eager to see how this could be processed. So we worked together for about a year to make it happen. I think our Tworkov catalogue was the first to be digitally archived by NYARC. The decision to pursue this partnership was simple, as having multiple copies of my research archived on as many digital platforms as possible will only work to our benefit. Further, it offered another point of access to the life and work of Jack Tworkov. As Tworkov was the brother of painter Janice Biala, how did their relationship as artists benefit the catalogue raisonné research process? Although they were siblings, Tworkov and Biala were two very different artists. Their art was as distinct as their personalities. While both knew the value and importance of an archive, I have found little research material in the Biala archives that support our Tworkov catalogue. However, in letters from Paris to her brother in New York, there are many times when Biala sent Tworkov lists of paintings for exhibition in New York. These letters have been instrumental in charting the movements of Biala’s paintings, and will be helpful as we continue to compile the life’s work of Biala in anticipation of launching her own online catalogue raisonné project in early 2020. Tworkov was one of the artists featured in the “Paints a Picture” series published by Art News. Has Tworkov’s studio practice and technical art history helped to shape the artist’s catalogue raisonné? Articles like the one you mentioned, written by Fairfield Porter in 1952, offer great insight into Tworkov’s studio life. At the time of this article, which was one of the first in a series, Tworkov was renting a studio across the hall from his friend Willem de Kooning. More telling were the photographs by Rudy Burckhardt that accompanied the article which capture Tworkov straddling his worktable and mixing color in palm-sized tin cans. These photographs, among many others in the archive, capture Tworkov and his work in situ. We see not only the paintings in progress, but also drawings for these paintings as well. And with a closer look over the artist’s shoulder, you’ll discover an inventory of paintings hanging on his studio wall. It’s any archivist’s greatest dream! Has having a developed catalogue raisonné helped to inform other publications about the artist? One of the major goals of the Estate is to publish a fresh new monograph on Jack Tworkov. Despite his many solo retrospectives and historic group exhibitions, there has never been a single monograph published on the artist. Plans are underway to find a publisher who will combine the writings with the art. The catalogue will be a vital tool. And, with access available from any place with an internet connection, the catalogue has been very successful in facilitating exhibitions and acquisitions as well as greater collaboration among collectors, curators, and other researchers. What’s in store for the next six years of the Tworkov catalogue raisonné? There are plans to redesign our website and the access point to the online catalogue. As technology progresses, so must we innovate. Beyond this… it’s research, research, and more research! As one question is answered, another is asked.